Parks Candles’ ‘3 Tots’ Gift Sets make an ideal choice for virtually anyone important in your life, even if they aren’t ‘into’ candles. Each of the ‘tot’ size candles in the set offers a distinctive, harmonious combination scents that virtually anyone can appreciate. Our ‘Tot’ Candles are each hand poured into a glass votive mini vase, with one of our finest, all-natural smokeless cotton wicks at its core. A single tot will burn for as long as 8 hours and rarely, if ever, needs trimming. The Orange, Cedarwood and Clove tot set is an instant favourite. Orange, of course, is a bright, clear and sprightly scent that begins to enliven the room even before the candle is lit. Citrus scents are generally said to reduce stress and lighten moods, and our all-natural orange essential oil seems to do just that. The orange combines with pure, naturally-harvested clove oil’s intense spiciness to form the scent so many of us associate with the holidays, fine pomanders, and some of our favourite desserts. Cedar is perhaps the subtlest scent in this mix. Cedarwood essential oil provides a mellow, earthy undertone which offsets the spiciness of the clove and the tartness of the orange in equal measure, binding all three together into a masterfully chosen whole. There can be no doubt why this is a customer favourite, it’s clear as soon as you open the box! 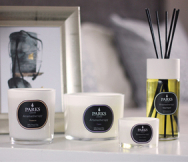 The Parks Candles’ Orange, Cedarwood and Clove 3 Tots Gift Set ships in a lovely gift box.